Richmond, Aaron S. Morgan, Robin K. Slattery, Jeanne M. Mitchell, Nathanael G. and Cooper, Anna Grace 2019. Project Syllabus: An Exploratory Study of Learner-Centered Syllabi. Teaching of Psychology, Vol. 46, Issue. 1, p. 6. Fizel, John 2015. A Presentation-Based Course in Sports Economics. International Advances in Economic Research, Vol. 21, Issue. 4, p. 361. Sulik, Gayle and Keys, Jennifer 2014. “Many Students Really Do Not Yet Know How to Behave!”. Teaching Sociology, Vol. 42, Issue. 2, p. 151. Holland, Lauren 2009. Democracy and Higher Education: The Nature of the Relationship. Journal of Political Science Education, Vol. 5, Issue. 2, p. 91. Kam, Cindy D. Wilking, Jennifer R. and Zechmeister, Elizabeth J. 2007. Beyond the “Narrow Data Base”: Another Convenience Sample for Experimental Research. Political Behavior, Vol. 29, Issue. 4, p. 415. Does the Wording of Syllabi Affect Student Course Assessment in Introductory Political Science Classes? 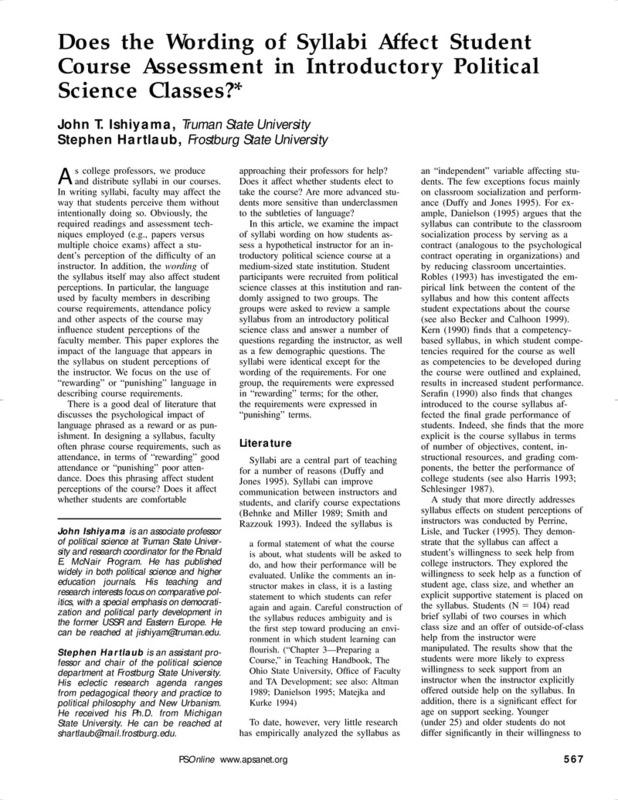 An earlier version of this paper was presented at the Annual Meeting of the Midwest Political Science Association, Palmer House-Hilton, April 19–22, 2001. Chicago, Illinois.